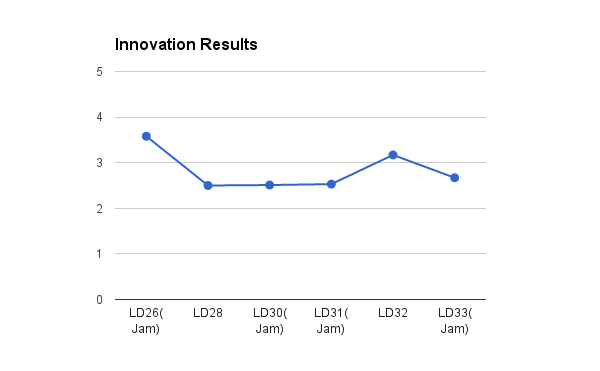 The judging period for Ludum Dare 33 finished recently and just like last time, I’ve decided to make a quick analysis of how I did for my entry First Person Giant Monster Game (although it’s probably about 2/3 weeks late), discussing where I did well and where I didn’t (Click here for the post-mortem). No surprises there. The theme is one of the categories I’m usually strong at since I always aim to make the mechanics for my entries be relevant to the theme as much as possible. 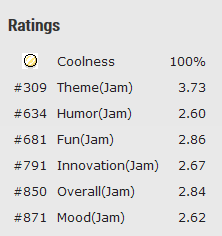 This time I scored slightly higher for Theme (a 3.73 compared to 3.04 for my last entry). 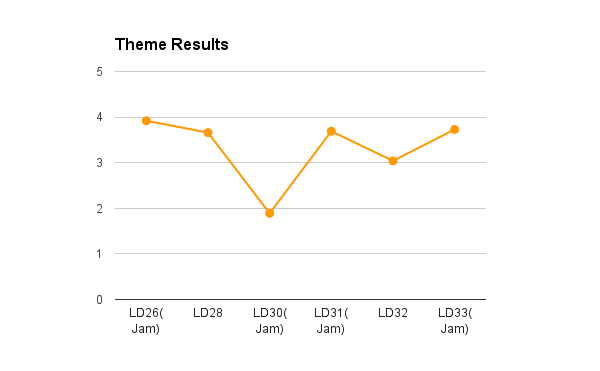 Below is the line chart comparing all my Theme scores so far. Again, apart from one entry, I have never had an entry where the score for Theme was lower than 3. For most of my entries (or to be more specific, those after the option to opt out of categories was introduced), I have never chosen to take part in the Humor category as I felt that my games didn’t have anything remotely funny in them. This time though, I decided to opt in to the Humor category for this entry as I felt that there were some aspects of the game one could interpret as quite amusing. My original hopes for the Humor score in my game was that players would find the idea of controlling a giant monster in first person to be strangely funny. However, much of the actual scoring for Humor probably came from an accidental bug in the game where a collision would sometimes cause the player to fly upwards towards the sky in a matter similar to a certain scene in The Simpsons. Whilst I could have taken the time to fix the bug myself, I decided to leave it in during the entire judging period as I found the bug to be quite hilarious myself. Although I aim to make some sort of unique gameplay mechanic for each of my entries, this time however I wasn’t able to create something similar for this one (which may because I was still getting to grips with Unreal Engine 4) and ended up with something where the entire gameplay was just moving and shooting at things (which isn’t particularly innovative at all) hence the lower score this time (a 2.67 compared to 3.17 for my last game) although I suspect much of the Innovation score came from my usage of Unreal Engine 4’s destructible meshes feature in the game. Despite the simple gameplay mechanics, quite a lot of people had some fun with the game. 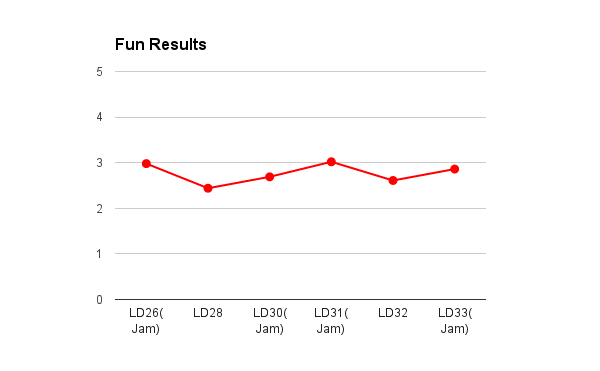 In fact, this time I scored slightly higher for Fun compared to my last entry (a 2.86 compared to 2.61). Like with the Humor category, I have never chosen to opt in the Mood category for most of my entries as I felt that none of them were able to invoke some sort of mood or tell a story. This time however, I decided to opt in for this entry partly due to the game’s apparent setting of a barren desert wasteland as well as the feeling of satisfaction players would get controlling a giant monster in first person. Compared to my last entry, my Overall score for this entry isn’t too different although it’s slightly lower (a 2.84 compared to 2.87). Unfortunately, just like most of my other entries, this one didn’t have enough polish and juice to make it truly stand out from the rest. This may be due to me struggling with Unreal Engine 4 throughout most of the jam and whilst the concept I decided to go for was interesting, I clearly didn’t have enough time to flesh it out and make it my own and for solo entrants such as myself, trying to find the right balance between innovation and polish is key. You may have noticed that I didn’t make an analysis of the graphics and audio results for this entry. This is because this time around most of the assets in the game came from 3rd party sources such as the optional starter content that new Unreal Engine projects come with as well as the example models by Mixamo that you can download from the Unreal Engine marketplace and so to keep things fair, I decided to opt out of judging for those two categories. In conclusion, despite some difficulties trying to work with Unreal Engine 4 for most of the jam (since it was my first time using it in a game jam based environment), I still managed to score just as well as my last entry and in the end a lot of people had fun with it. Choosing to enter the 72 hour jam instead of the 48 hour compo was a good decision especially since I needed the extra time to get to grips with using Unreal Engine 4. However, I felt that I could have gotten a better score if I was able to create more builds for the game than just the Windows version (I unfortunately had no Mac to build a version of the game for that platform and whilst I did manage to make a HTML5/WebGL build for browsers, I had to take it out as it didn’t support destructible meshes). For the next Ludum Dare (in December), I still plan on entering the 72 hour jam as I want to make use of the extra time to make my entry as completely polished as possible although this time to make things easier for myself, I will probably use an engine I’m more familiar with such as Unity although given how long I have until the next jam, there’s still time to improve on my Unreal Engine 4 skills. I do one day however, plan on entering the jam with friends and create a team entry.